Stressed out with too much unsolicited tagging by friends on Facebook? Granted that tagging is fun, but when your friends starts tagging your name in too many unrelated photos and videos, or just to get their photos or messages onto your Wall for your ring of friends to see, it starts to become rather annoying. Of course, you can untag yourself, but in cases like these prevention is always better than constant untagging. 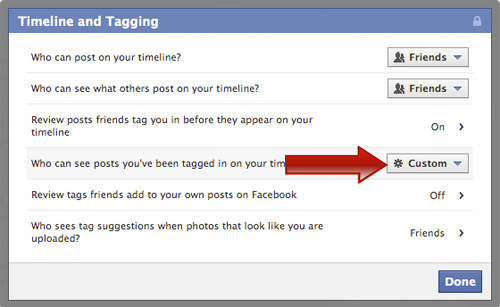 There are unfortunately no way you can stop the tagging activities on Facebook, however there are ways to control how your tagged photos and videos will appear on your Facebook Timeline. First of all, you may have a number of unrelated photos already tagged to your Facebook profile. 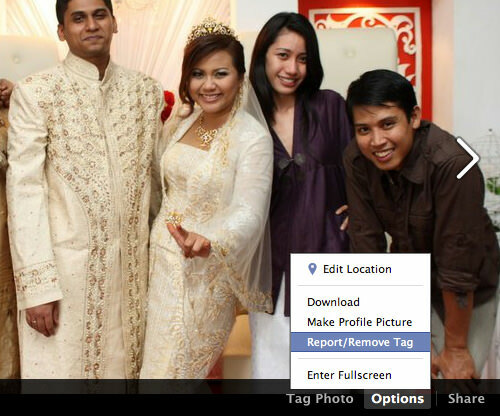 To remove this tag, simply open the photo from the album, hover the cursor over your name and click Remove tag. If the link does not appear, you need to look for the link Options found at the bottom right of the photo, then select Remove Tag. Then select the reason why you want to remove the tag and click Continue. If you are fine with the tag, but prefer not to receive new updates of new comments or ‘Likes’, open the photo and click the Unfollow Post link just above the comment box. 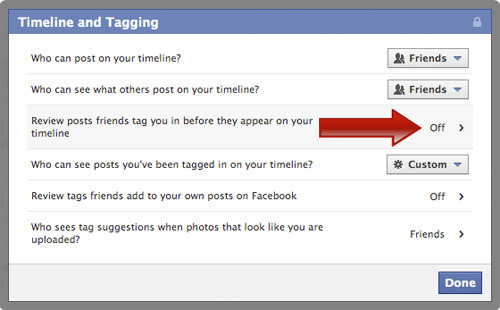 As mentioned earlier, there is no way to stop any of your friends from tagging you on Facebook, but you can decide how the tagged photos and videos will appear on your Facebook Timeline. 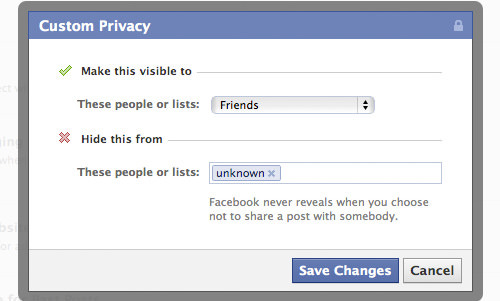 To control this, go to your Facebook Privacy Setting menu from the top right corner of your Facebook page. 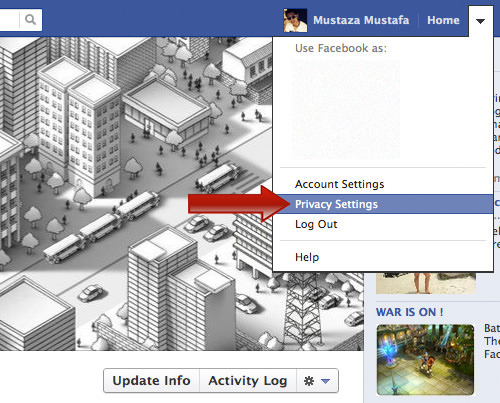 In the Privacy Settings page, scroll down to the Timeline and Tagging section and click on Edit Settings. 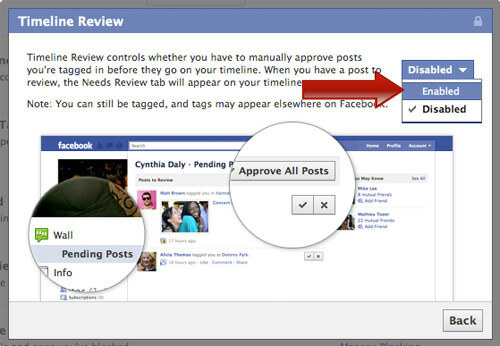 A popup window will appear, click on the Review posts friends tag you.. section. Click the drop-down menu to select Enable. After selecting this option, every photo or video you are tagged in will be hold up for your review and approval before it gets posted on your Timeline. 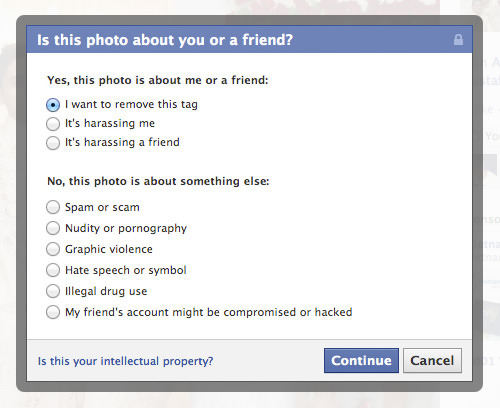 Take note that, according to Facebook, if you select this option, your friends can still tag you and the tags may appear elsewhere on Facebook, but not on your Timeline until you decide to approve it. 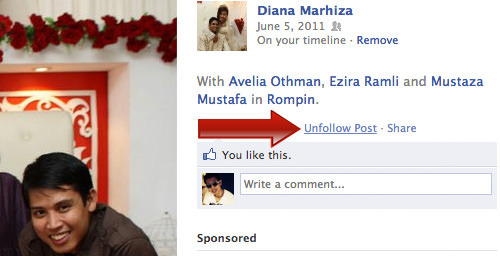 In the next popup window, select who can see the posts you are tagged in from the dropdown menu Make this visible to. You can also Hide the posts from selected people or lists you already created on Facebook. Once selected, click on Save Changes for the setting to take effect immediately. There has yet to be a way to fully stop friends from tagging you. At best you get to review the tags as well as control who gets to see what you are tagged in. So what is your experience in controlling your photo tagging story? Do you have a better way? Do share.